Home CCTV Solutions That You Can Check In On Remotely. Home CCTV systems are being pushed more and more by insurance companies in a bid to lower the chance of you making a claim and they reward you for your installation of a home CCTV system, that you can check in on remotely or has a recording facility, by lowering your annual premiums. Although in saying this, the increase in conviction in crimes has increased in Australia with the Federal and State Police attributing this outcome to the use of home CCTV footage. This makes a lot of sense, as criminals are quick to identify government and business sercurity systems and adjust their crimes around that, but to be adept with each homes security systems in the area would be near impossible. So with this demand there has been an influx of systems that are DIY’s from JB HiFi and JayCar and Ebay, but most times there is a little twist to installing it, this ends up being installed by a locksmith or not properly at all. We get it though, if you are savvy enough to set up the camera system, position the camera and get everything going smoothly on your own these systems are great, the only concern after that would be replacement parts and upgrading of technology. This leads to a long term issue with these systems is that it is tricky for locksmiths to be able to adequately service a store bought alarm/CCTV system and replace parts that will support it, so sometimes (when the main port of the system is compromised) the system may need to be replaced. With our experience in the security industry we have seen a lot of these DIY camera systems come and go. A product that we have been excited to use is the ABUS CCTV security systems. We install and service the ABUS 7″/3″ MONITOR & 1xIR DIGITAL WIRELESS CAMERA 2.4GHz; it has a high pixelation in that cameras, can record to an SD card and can be used through an app on your phone or ipad. This system supports a 4 camera usage system that will allow adequate external and internal visibility of your property whilst you are home or away. This system is ideal for private homes, restaurants, offices, and small businesses. This system allows remote access wtih the image and sound being transmitted between the camera and monitor on a secure basis. This excludes the possibility of third parties viewing the images or listening in. We can install any part of the ABUS security range, for further options for what you may need for your home we have included a link to the main supplier site. Then contact us to inquire about what would be the best solution for your home or small business. 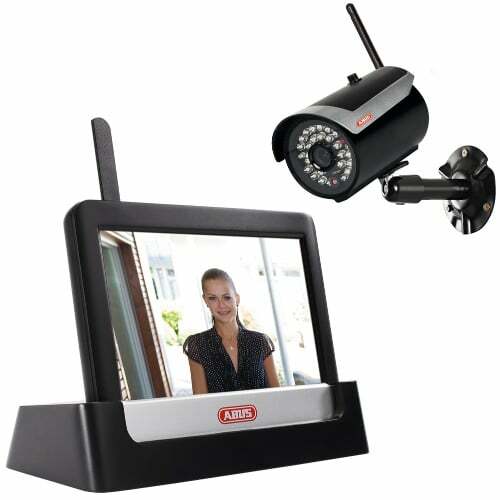 Complete set consisting of an IR wireless outdoor camera, monitor, and docking station. Video transmitted using encrypted digital radio. Compact IP66 outdoor camera with infrared night vision function and 640 x 480 pixel resolution. 7″ colour touch-screen monitor (operates on rechargeable batteries). Mobile access via iPhone, iPad app. Remote access via LAN using the docking station (battery for monitor charged at the same time). Can be extended to include up to four wireless cameras (TVAC16010).